The following is a chronological account of the actions taken by the U.S. Military under the leadership of George W. Bush as Commander-in-Chief that lead to multiple violations of the Geneva convention and U.S. Military Code. George W. Bush has conspired to commit the torture of prisoners in violation of the "Federal Torture Act" Title 18 United States Code, Section 113C, the U.N. 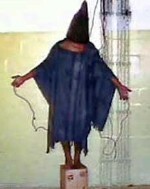 Torture convention and the Geneva Convention, which under Article VI of the Constitution are part of the "supreme Law of the Land;"
Secretary Powell writes a memo arguing that Alberto Gonzales’ attempt to declare the war in Afghanistan exempt from the Geneva convention undermines more than a century of U.S. policy and practice. Bush declares pre-emptive war in Iraq, which constitutes a "grave breach" of the Geneva convention as Iraq posed no "imminent threat" to the U.S. Protected "against insults and public curiosity?" "Prisoners of war must at all times be humanely treated. Any unlawful act or omission ... causing death or seriously endangering the health of a prisoner of war in its custody is prohibited, and will be regarded as a serious breach of the present Convention. Likewise, prisoners of war must at all times be protected, particularly against acts of violence or intimidation and against insults and public curiosity." "No physical or mental torture, nor any other form of coercion, may be inflicted on prisoners of war to secure from them information of any kind whatever. Prisoners of war who refuse to answer may not be threatened, insulted, or exposed to any unpleasant or disadvantageous treatment of any kind." "Prisoners of war shall enjoy complete latitude in the exercise of their religious duties, including attendance at the service of their faith, on condition that they comply with the disciplinary routine prescribed by the military authorities." "The following acts are and shall remain prohibited ... cruel treatment and torture; ... Outrages upon personal dignity, in particular, humiliating and degrading treatment." "Individual or mass forcible transfers, as well as deportations of protected persons from occupied territory ... are prohibited, regardless of their motive." Department of Defense writes a memo which authorizes interrogation tactics for use at Guantanamo including using dogs to induce stress, stripping and shaving prisoners, and stress positions. Also included is a memo with an analysis of how the interrogators at Guantanamo (GTMO) became more willing to conduct extreme interrogation techniques. "Using detainees individual phobias (such as fear of dogs) to induce stress." Memo written by a U.S. Army General in response to the torture memo put out by the Department of Defense. "Detainee will be sent off GTMO, either temporarily or permanently to Jordan, Egypt, or another third country to allow those countries to employ interrogation techniques that will enable them to obtain the requisite information." "It is a per se violation of the U.S. Torture Statute. Discussing any plan which includes this category, could be seen as a conspiracy to violate 18 U.S.C. s. 2340. Any person who takes any action in furtherance of implementing such a plan, would inculcate all persons who were involved in creating this plan. This technique can not be utilized without violating U.S. Federal law." "Several of the exceptional techniques, on their face, amount to violations of domestic criminal law and the UCMJ [Uniform Code of Military Justice] (e.g., assault)... Other nations are likely to view the exceptional interrogation techniques as violative of international law and perhaps violative of their own domestic law. This places interrogators and the chain of command at risk of criminal accusations abroad, either in foreign domestic courts or in international fora, to include the ICC." Major General, U.S. Air Force, Deputy Judge Advocate General. "The [Detainee Interrogation] working group believes use of [the] technique ... would constitute torture under international and U.S. law and, accordingly, should not be utilized. In the event SECDEF decides to authorize this technique, the working group believes armed forces personnel should not participate as interrogators as they are subject to UCMJ [Uniform Code of Military Justice] jurisdiction at all times." Rear Admiral, JAGC, U.S. Navy, Judge Advocate General. The Office of Inspector General writes a report revealing that senior leadership knew of the torture going on in Iraqi prisons. 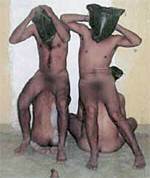 New Yorker Article showing the Bush administration's knowledge and approval of torture policies. 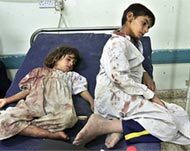 "Civilian hospitals ... may in no circumstances be the object of attack but shall at all times be respected and protected..."
"The protection to which civilian hospitals are entitled shall not cease unless they are used to commit, outside their humanitarian duties, acts harmful to the enemy. Protection may, however, cease only after due warning has been given, naming, in all appropriate cases, a reasonable time limit and after such warning has remained unheeded." 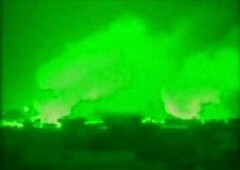 U.S. Military conducts operations destroying two hospitals, denying medical assistance to civilians, conducting indiscriminate bombing campaigns on innocent civilians as "collective punishment." These are all Geneva violations. "American forces dropped five 500-pound bombs on 'insurgent targets.' The Americans destroyed the Nazzal Emergency Hospital in the center of town. They stormed and occupied the Fallujah General Hospital, and have not agreed to allow doctors and ambulances go inside the main part of the city to help the wounded, in direct violation of the Geneva Conventions." 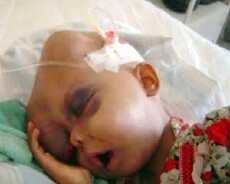 Discussion by the Scottish Parliament over U.S. violations of the Geneva convention related to the use of depleted uranium in Iraq. At a press conference in Geneva, Jean Ziegler, a senior United Nations official reports on U.S. Geneva violations related to starvation of civilians. U.S. Federal Supreme Court Decision that the military tribunals being conducted were violations of the Geneva convention.